Welcome to the Shaker Furniture & Handworks Home Page one of the most distinctive furniture stores in the entire Chicago-land area. Since 1991, Shaker Furniture & Handworks has distinguished itself as one of the most distinctive furniture stores in the entire Chicago-land area. 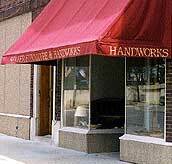 Shaker Furniture & Handworks is the only store that custom finishes authentic Shaker reproduction furniture. But if Shaker doesn't fit your decor, Shaker Furniture & Handworks also offers a select and distinctive grouping of fine American furniture companies. Each of these companies was carefully chosen for their excellent value in solid wood production furniture made by American craftspeople. Many people though are unable to find production furniture that fits their homes or their needs. Shaker Furniture & Handworks can custom make any piece of furniture in any wood and style - finished the way you want! Lastly, Shaker Furniture & Handworks offers a wide assortment of the finest handworked arts and crafts to accessorize your home or make uncommon gifts. For more information, send a quick e-mail to . Phone: (847) 696-4700. 7 South Fairview Avenue, Park Ridge, IL 60068. Copyright©2004, Shaker Furniture&Handworks. All rights reserved. All our furniture is made by American craftspeople.